The folding walker with seat is a great product. In fact, if you are looking for a walker with big wheels, this will probably be the best rollator you will find. With a long list of features and a lightweight frame at just 8kg, the folding walker with wheels is a product that is available at a great price and backed up by the great customer service that Amazon is known for. 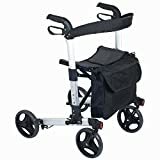 The frame is height adjustable so it should be suitable for larger people or smaller people and because of its excellent build quality, this rollator has an excellent user weight limit of 21st. This a very modern looking walking frame in a market with some very ugly products. It’s modern look is backed up by a great list of features. The design of this walker is similar to that of the Gemino rollator, just a little cheaper. As it is so lightweight, it means the folding walker with wheels can be transported easily and the fact it can be folded to lay flat makes it even better. The front wheels are also removable by simply pressing the red button on the wheel itself. The mesh seat and back are very hard wearing so should last you a long time. The easy grip handles have cable brakes that lock so the user can be confident they are safe when sitting and standing up from the walker. The large shopping bag on the front of the rollator is a nice feature. Made from strong material, this bag was larger than it looked on the picture and held more than we thought it would. Also, because the bag is removable it can be taken off when not required and used when shopping. Unfortunately when folded, the walker does not have a clip to hold it all together however this minor detail did not cause a big problem. Overall the folding walker with seat is an excellent mobility aid. Thanks to it’s lightweight frame and how easy it folds up, it can be transported very easily. Where to buy the folding walker with seat? Click the button to find more information about this product. 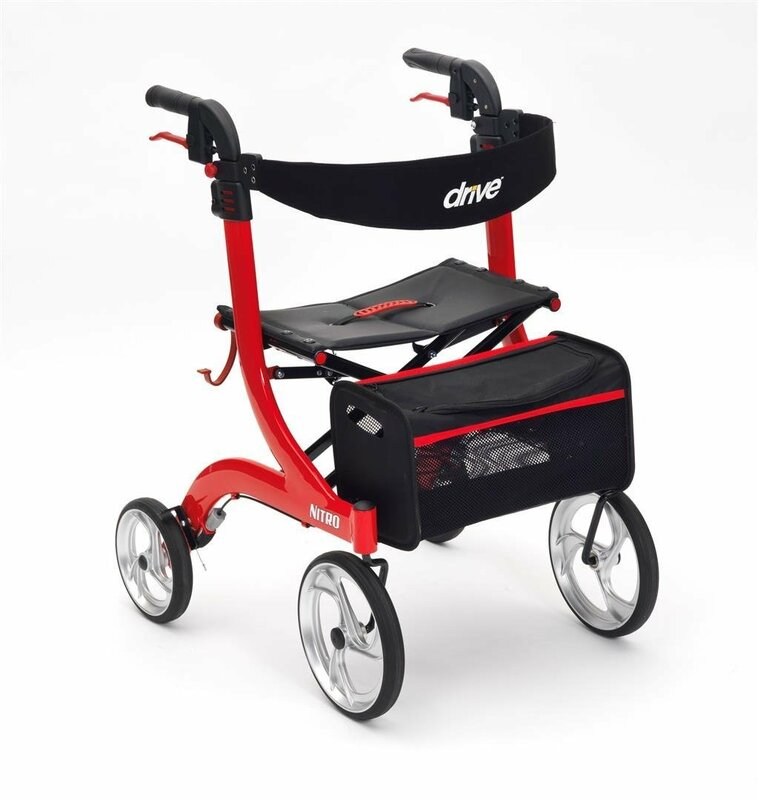 We search online to find the best mobility aids at the best price. I have worked in the mobility industry for over 8 years and have experience working with customers and suppliers.